It was a pleasure to return to Eternity Springs! 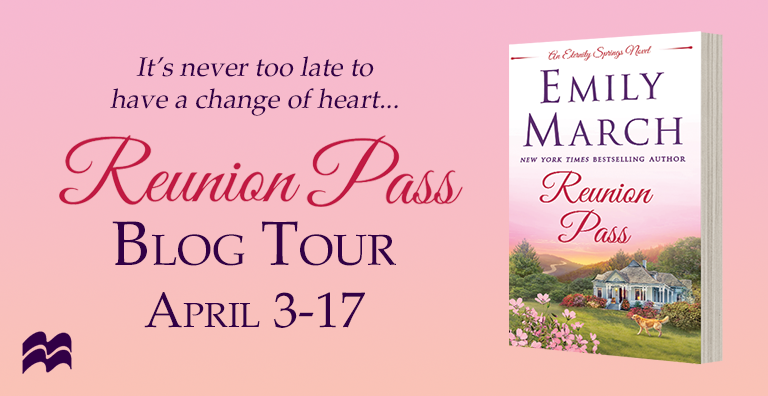 Reunion Pass is book #11 in the series and is my absolute favorite to date. If you’ve read the previous books in the series you’ve meet Chase Timberlake and Lori Reese. Reunion Pass is their story. If you haven’t read the other books in the series, you’ll be able to follow the story here with no problem. However, I always recommend reading a series in order. That’s a personal preference. Chase and Lori are high school sweethearts. After high school they try a long distance relationship and Chase even purchased an engagement ring. But … there’s always a but, right? Chase’s adventure photography career takes off and Lori’s dream of completing veterinary school becomes her top priority, and their happily ever after never comes to pass. They drift apart. Time passes. Chase’s life takes a tragic turn and he returns to Eternity Springs a damaged man. Lori has returned to Eternity Springs after completing her veterinary degree. Reunion Pass made me smile. It made me cry. There were great moments that I could relate to and these moments grabbed my heart and haven’t let go. I couldn’t turn the pages fast enough. Would Lori help heal Chase? Would they find love again? Would Eternity Springs heal them both like the town had healed so many others? You’ll have to grab a copy of Reunion Pass to find the answers for yourself because you’ll get no spoilers from me! Add this book to your list! You won’t regret it. I hope it will touch your heart like it has mine. As a reader of all the other books in the series it was nice to be updated on the other residents of Eternity Springs. Ms. March does a great job of updating us on everyone while not taking away from the main characters of this book. It’s always great to catch up with these great characters. I have just one question. When can I move to Eternity Springs? Want to know a bit more about Emily March? March participated in our Ten Questions series several months ago. Check out her interview here.